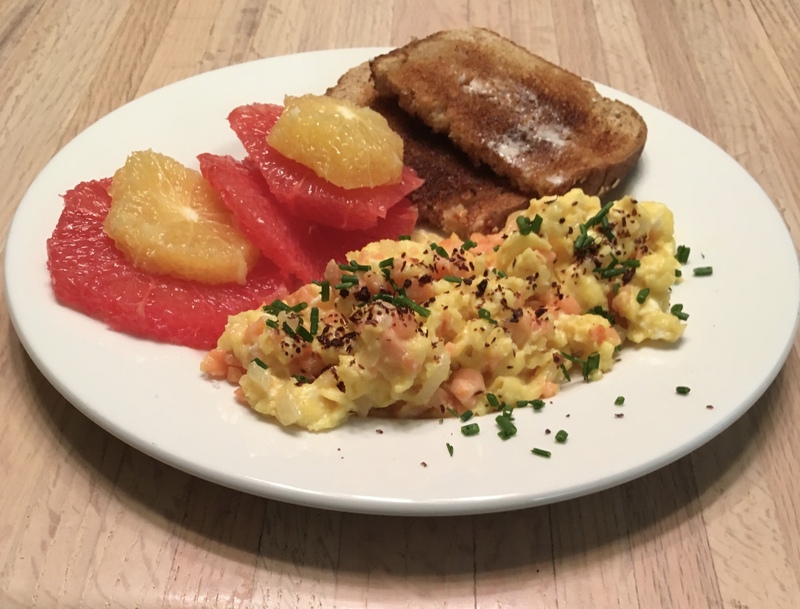 On December 9, I posted A New Salmon Treat and a Finessed Scrambled Egg Technique for Me. I apologized for the photo because the smoked salmon I used was smokey dark and not too attractive. This morning, I repeated the recipe and used a nice pink cold smoked salmon that was very close to lox. The result was much more attractive and brighter in flavor than with the other smoked salmon. If you browse back to Dec. 9, I’m sure you’ll agree. Soft scrambled eggs with smoked salmon, Aleppo pepper and chives. A nice breakfast to start my day! On the side, slices of grapefruit and Valencia orange and toast. The technique I described was making light and creamy textured soft scrambled eggs. The secret is that the eggs are not overbeaten. They are just whisked until yolks and whites are blended – 20 t0 30 seconds. 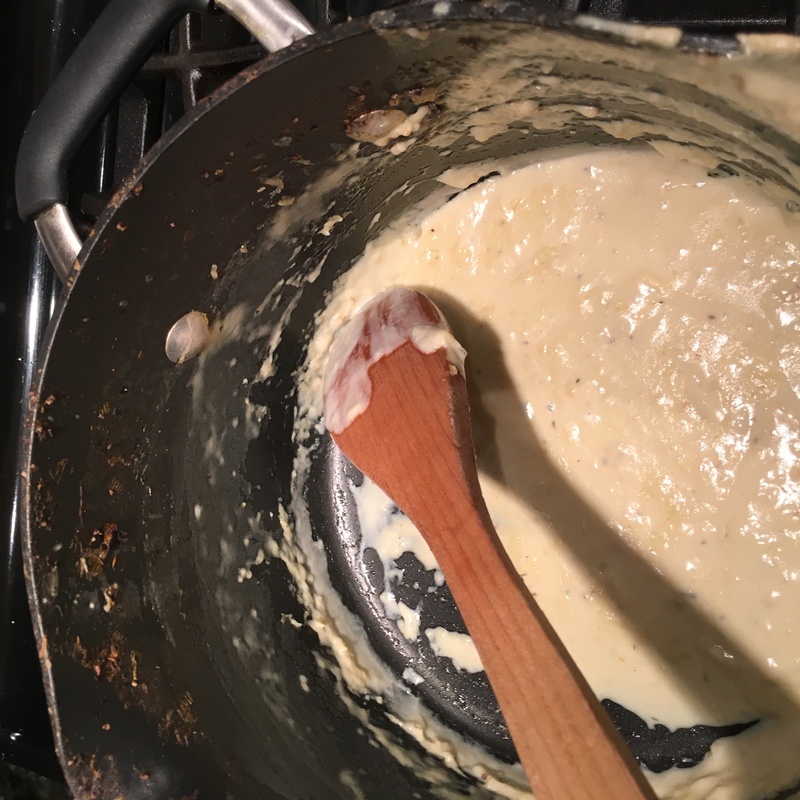 The eggs are cooked in 1 Tbsp butter and stirred constantly, preferably with a rubber spatula, until the eggs become soft curds and are almost cooked, perhaps two and a half minutes. Then they are removed from heat and any additions (in this case the salmon) are stirred in. The eggs remain a bit moist and very soft. Serve them quickly while still warm. Very simple, very light and more pleasing to the palate than overcooked dried out scrambled eggs. Easy to make with just a little practice. The complete recipe is still up on the Dec. 9 post. I believe you dine with your eyes, your nose and your mouth. This salad pleases all three senses, especially when served with oven roasted marinated lamb chops. Bitter greens combine with carrots, oranges and turnips tossed with a lemon and shallot vinaigrette that will make you moan with pleasure at first bite. Lamb chops marinated with lemon, garlic and oregano were wonderful. But the eye popping salad stole the show at dinner. Whisk vinegar, lemon juice, shallot, and mustard in a medium bowl. Whisking constantly, gradually add oil. Whisk until emulsified; season vinaigrette with kosher salt and pepper. Stir in thyme. Toss watercress, radicchio, carrots, turnips, oranges, kumquats (if using), and toasted walnuts in a large bowl. Drizzle with vinaigrette, season with sea salt and pepper, and toss again to coat. I reduced the volume of this salad because it was only for two, but not the dressing. I still have enough of everything to make it again! I used one Cara Cara orange for its nice pink color and one Valencia orange for contras in color and size. The raw turnip was a very good taste surprise in the salad. I added a few leaves of curly endive for dark color and another bitter bite. I substituted rice vinegar for the champagne vinegar called for in the original recipe. This vinaigrette was so good I want to play with it more… maybe substitute mirin for the rice vinegar. I used mirin made from sake, not the grocery store alcohol and seasonings kind. There is a difference! It was convenient to increase the oven temp after removing the toasted walnuts. I roasted the lamb chops in the oven at 400º to an internal temp of 160 because I like the pink on the inside. If it had been a little warmer, I’d have grilled them outside. Coquilles St. Jacques – There’s always a first time! 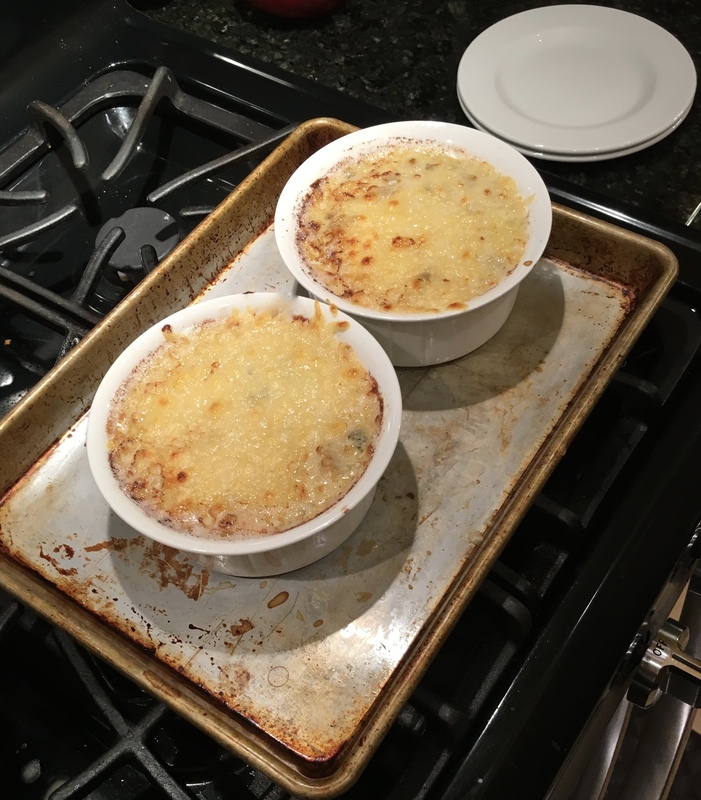 My friend Daryl posted an adventure he had making Coquilles St. Jacques Santa Fe Style. He worked of scallops, mushrooms, scallions, wine, butter, flour and cream, red chile, pine nuts, cilantro and asadero cheese. He saids he started with Julia Child’s two basic Coquilles St. Jacques recipes in the first volume of Mastering the Art of French Cooking and added some spices and herbs to make the classic “Santa Fe Style.” He must have been blessed that day by San Pasqual, patron saint of gringo cooks in Santa Fe. The dish looked wonderful and I’m sure the flavors were sensational. I have loved Coquilles St. Jacques since I first tasted it many years ago. I like the creamy white wine sauce version and can rarely find it in El Paso. I had never made it and, after reading Daryl’s adventure, and reading Julia Child’s recipes, I decided I could make it. Coquilles St. Jacques – scallops and mushrooms in a white wine sauce topped with melted Swiss cheese. I couldn’t wait to taste and apologize for not taking a picture of the dish under the cheese. My attempt was successful and delicious, if I do say so. With that success under my belt, I’ll give Daryl’s recipe a try very soon. Le pot of sauce. Enough left in the pot to sop up with a bit of bread! While the recipe is not difficult, it does use a lot of prep bowls, pots and pans. I’ll try to use fewer next time. The recipe for Coquilles St. Jacques Á La Parisienne can be found in Julia Child’s Mastering the Art of French Cooking Volume 1. I am a great fan of bagels and lox with a schmear of cream cheese, onions and capers. I should have been a New Yorker. A few days ago, I posted soft scrambled eggs with smoked salmon and lamented the fact that I hadn’t found lox. I still have left over smoked salmon. 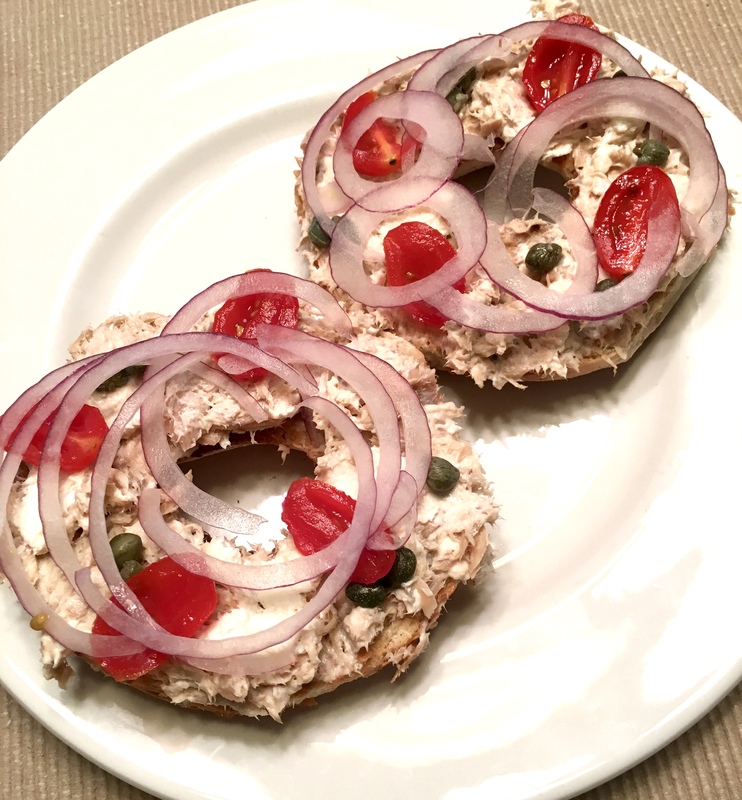 This morning, I stirred a chunk into some whipped cream cheese, schmeared it on toasted bagel halves and added red onion, capers and very thin slices of grape tomato. Almost as good as lox! And now, I only have to deal with one more serving of smoked salmon! Cream cheese and smoked salmon on a bagel ala deli-style bagels and pseudo lox. Almost as good as the real thing. My dog has be come enamored of a baked salmon and sweet potato biscuit developed by Paul Newman’s daughter, Nell, under the Newman’s Own label. They must be very special. Both times I have opened the smoked salmon packet, she’s been right there ready for some. Of course, she gets the biscuit; smoked salmon is not for doggies. When I go to Jerusalem, I mean a Middle Eastern grocery that carries spices, grains and canned foods I have just begun to explore. Enter the store and breathe deeply; The spice scent is heady and amazing to this West Texas nose. This Jerusalem is where I found Aleppo Pepper before it appeared at our Williams Sonoma outlet. It is also the one place in a search of two cities that I found Sumac… not the poison kind that grows in the eastern U.S., but the sumac grows across the middle east and in northern Italy. Its red berries are dried and ground into a coarse powder that is a reddish purple that is almost black. It has an astringent flavor that is not quite like the acidity of lemon but will put a little pleasant pucker in your jaw. It is used to season poultry and fish and all kinds of vegetables. I found a recipe using sumac in a creamy salad dressing complementing a surprising combination of vegetables and fruit. Mixed Lettuces with Kohlrabi and a Creamy Sumac Dressing has tang and crunch and is going to be made again. The salad was the feature of the meal. On the side was an oven baked small pork chop seasoned with sumac. Preheat oven to 350°. Toast slivered almonds on a rimmed baking sheet, tossing once, until golden brown, 10–12 minutes. Let cool; crush in a plastic bag with the bottom of a mixing cup, the side of a broad knife or a rolling pin. Remove peel and white pith from grapefruit; discard. Cut along sides of membranes to release segments into a small bowl; discard membranes. season with salt and pepper. 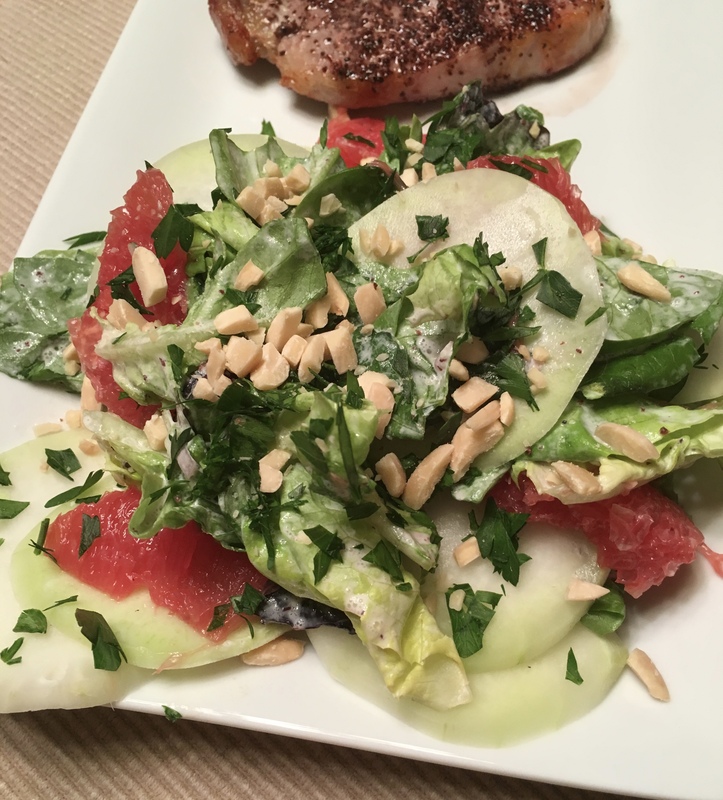 Tuck kohlrabi and grapefruit under and between lettuce. Top with herbs, almonds and a good sprinkle of more sumac. Sumac can be found at Middle Eastern markets, specialty foods stores, and online. It is Meyer lemon season. They are thinner skinned and less acidic than regular lemons. 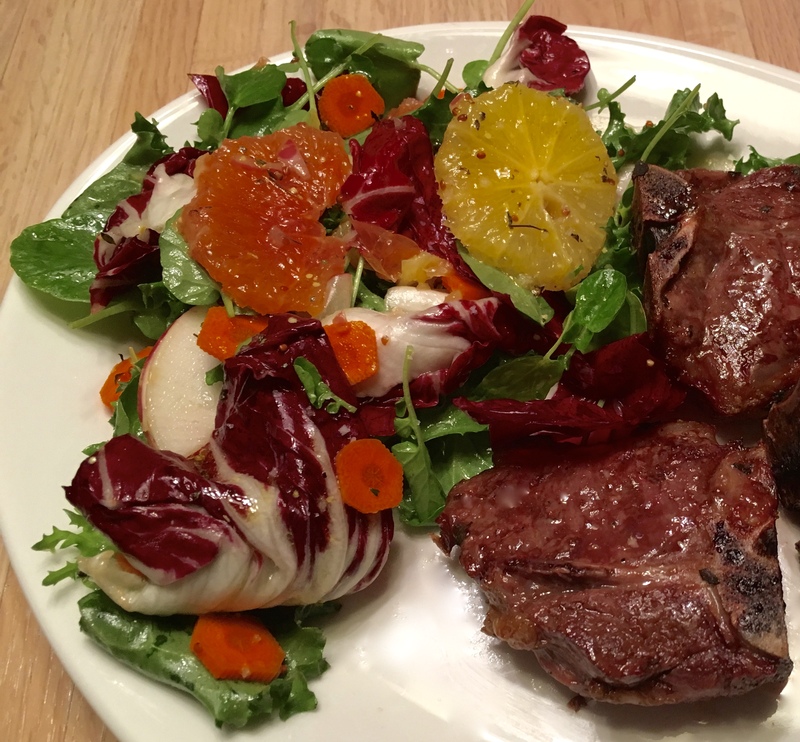 I like to broil slices of red grapefruit, navel oranges, blood oranges and Meyer lemons in the winter for a breakfast salad. Broiling caramelizes the citrus’ sugars and makes the special. I’ve served this citrus salad for desert with chocolate waffles baked in my waffle stick maker and ice cream. Kohlrabi is underappreciated and misunderstood. But it’s a favorite crunch: sweet, dense, and snappy and it reminds me a little of sliced raw turnip. It’s bulb grows above ground and its stems and leaves make me think of something from outer space or maybe an inverted jellyfish. Be brave, peel one and try it sometime. If a recipe says fennel, I’m odds are I’ll be making it. I love fennel raw and cooked and just to sniff! Salmon is another give it a try ingredient. It is conveniently one of the few fresh fish I can get here in the desert. I found a recipe for slow-roasted char with fennel salad and have no idea what char is or where to look for it. I read that it is a mild firm fleshed fish and figured it should be good with salmon. It is great with salmon! It’s hard to say which is better, the salmon or the fennel salad. I’ll just have to love them both. Meanwhile, place salmon in a 2- or 3-qt. baking dish and coat with 1 Tbsp. oil; season with salt and pepper. Roast until flesh easily flakes apart and a paring knife inserted into fish meets no resistance, 15–18 minutes. 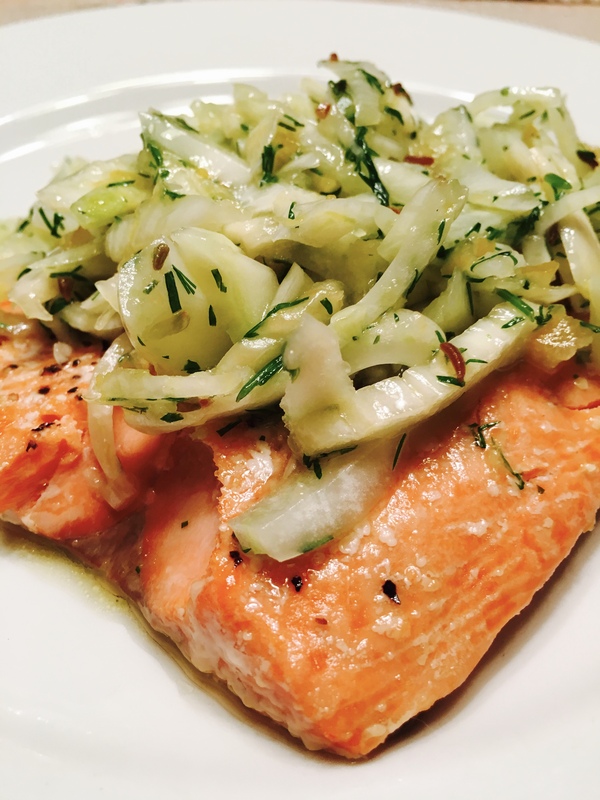 Serve salmon topped with fennel salad. The sugar, caraway seed and garlic steeped in vinegar make an amazing dressing for the fennel and a nice accent to the rich salmon. You can order a jar of preserved lemon. It’s pricey, but you use very little at a time and it keeps a very long time in the fridge. It is lemony and salty at the same time and really sets off a dish. I found an interesting recipe and helpful technique video for soft scrambled eggs and lox. Even though I did not find lox, I found a package of smoked salmon and decided to give it a try. I recalled the time my daughter accidentally invented a dish by using a spice the same color as the one her recipe called for. I hoped my salmon substitution would fare better than that early cooking attempt. I am happy to report that the eggs with smoked salmon was very good. The salmon was darker and more oily than lox which darkened the eggs. I’ll keep looking for lox and make this again. 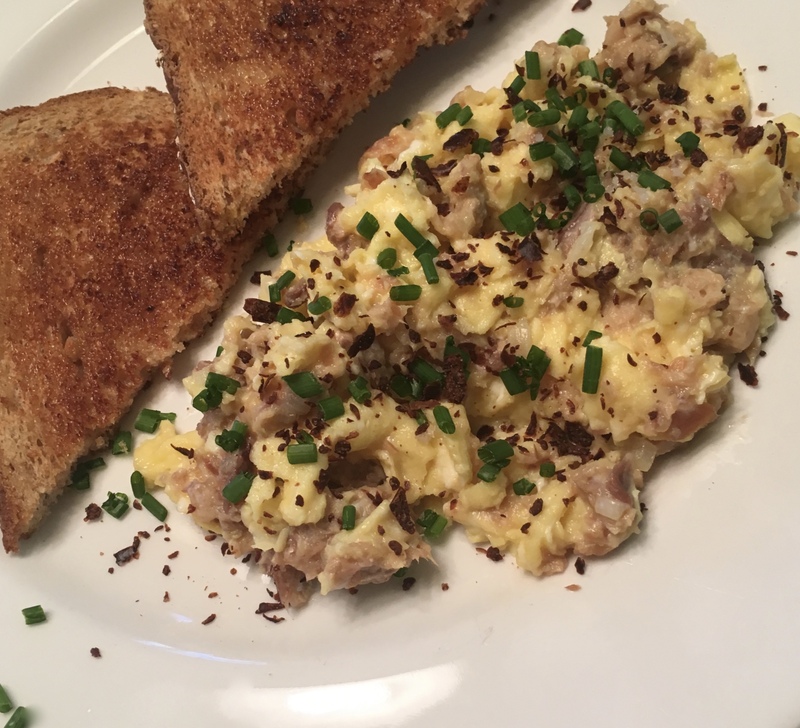 Soft scrambled eggs with smoked salmon, chives, Fleu de Sel and Aleppo pepper, with a side of buttered toast. The technique I learned was making light and creamy textured soft scrambled eggs. The secret is that the eggs are not overbeaten. The are just whisked until yolks and whites are blended – 20 t0 30 seconds. The eggs are cooked in butter and stirred constantly, preferably with a rubber spatula until the eggs become soft curds and are almost cooked, perhaps two and a half minutes. Then they are removed from heat and any additions (in this case the salmon) are stirred in. The eggs remain a bit moist and very soft. Serve them quickly because they cool rapidly. Very simple, very light and more pleasing to the palate than overcooked dried out scrambled eggs. In a medium nonstick skillet, heat the butter over medium-low heat. Add the onion and season with a pinch of salt. Cook, stirring occasionally, about five minutes until soft and translucent without browning the onion or the butter. Crack the eggs into a medium bowl and whisk just until the yolks and whites are blended. Do not overbeat. Add to onions and butter in the pan and stir constantly until curds form and eggs are nearly fully cooked. Remove from heat and stir in the salmon (or lox). Plate and garnish with chives, Aleppo pepper and finishing salt. Serve right away. Aleppo pepper is a Moroccan pepper I found in a dry coarsely chopped form. I found it in a middle-eastern grocery which somehow usually has the “different” spices I look for. A pound was less expensive there than at the high end spice store’s 3 oz. container! Aleppo pepper is savory with a very mild heat level. The flavor is intriguing and I’m enjoying trying it on a variety of proteins and salads.